The team at Lone Star Pharmacy is committed to delivering the best patient care around. Get to know our Canyon Lake pharmacists and staff below. Visit your new local healthcare family today. Josephine was accepted into pharmacy school as a senior in high school as part of their accelerated dual acceptance program. She graduated from Midwestern University - Chicago College of Pharmacy in 2009. In 2013, Josephine decided to move and relocated in Texas where she enjoys its people and culture. Her focus is community pharmacy and participates in community events that promote health issues. 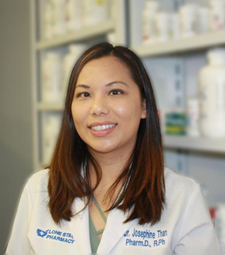 Josephine’s dedication to the duties and responsibilities of a pharmacist has earned her several accolades such as the Texas Pharmacist of the Week Award in 2015, and an article featuring her in the Pharmacy News Today Magazine. When Josephine is away from her duties as pharmacist, she enjoys spending time with her husband and daughter, traveling, and experiencing new restaurants. 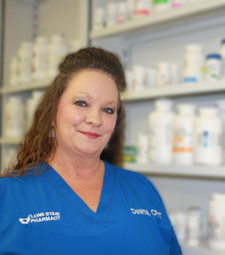 Dawna began her career at Mountain Valley Pharmacy as a cashier in 2013. She soon learned that the pharmacy environment was something she wanted to pursue and thus, obtained her certification as a Pharmacy Technician in 2015. She has been a resident of Canyon Lake for 22 years. She and her family, including her husband and 3 children, have graduated from the local Canyon Lake high schools. Her hobbies include cooking, spending time at the river, and riding bikes. LuAnn was born in Camden, NJ and moved to Texas at the age of 17. She has been in retail for 40+ years. She began working at Mountain Valley Pharmacy in 2003, when Larry and Lelynda owned and managed it. 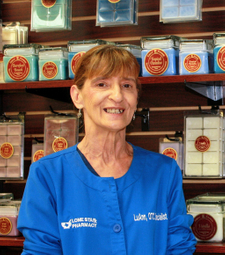 She continues to work at the pharmacy, now Lone Star Pharmacy, which is under new management. When LuAnn is away from her pharmacy duties, she loves to play with her Rottweiler, spend time with her daughter and grandkids, eat ice cream, and talk to her son and daughter- in- law, who live in South Carolina. Carina is the newest employee at the Lone Star Pharmacy. She is a pharmacy technician trainee, who just started in April 2017. She enjoys kayaking, hiking trails and gardening. Carina is quite friendly with a pleasant personality. She is eager to meet you and get to know you. 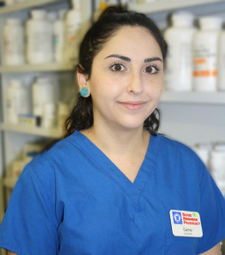 Do not hesitate, come on by and say hello to Carina and the rest of the staff at Lone Star Pharmacy!